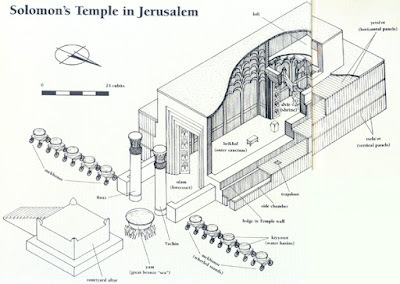 A recent post on the Biblical Archeology website explores a curious detail about the entrance of Solomon's Temple as described in the 1 Kings account of its design which plays such an important role in Masonic ritual and legend. King Solomon’s Temple was resplendent. Described in 1 Kings 6–7, the temple was divided into three parts: the forecourt (ulam), the outer sanctum (heikhal) and the inner shrine (devir), also known as the Holy of Holies. Built of stone and roofed with wooden beams, Solomon’s Temple was intricately ornamented. Its interior walls and floors were lined with wooden boards and covered in gold. It took seven years to complete the temple and its furnishings. 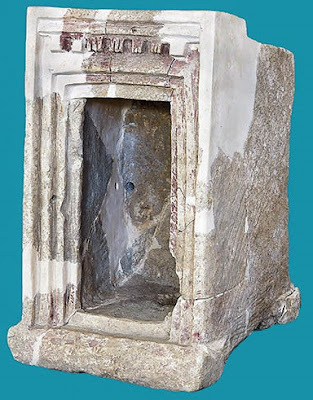 A nearby temple of the similar period located just 20 miles away from the Temple Mount in Jerusalem — Khirbet Qeiyafa — may hold the answer to this curious description and the enigma of "five doorposts." That temple is known to have been occupied in the 11th-10th century B.C., and was a fortified site in Judah from the time of King David. [Researchers] Madeleine Mumcuoglu and Yosef Garfinkel present a building model from Khirbet Qeiyafa that depicts a doorframe with three—or maybe four—interlocking doorframes surrounding an opening. They suggest that these interlocking frames are what is meant by mezuzot in the description of Solomon’s Temple. According to their interpretation, then, the doors to the inner shrine (devir) of Solomon’s Temple did not have five doorposts—but rather five recessed doorframes. "There is a gradual increase in the number of recessed doorframes from the entrance to the forecourt (three) to the outer sanctum (four) and finally to the entrance from the outer sanctum to the devir (five). It is as if the devir had the highest number of mezuzot because it was the most sacred part of the Temple." This reconstruction of the doorway into the Khirbet Qeiyafa temple (photo) depicts an elaborate doorframe surrounding the opening. The recessed doorway within the four interlocking frames sets apart the inner room as a sacred space. These may have been what was referred to in the Biblical account as the five mezuzot. "Gather 'Round the Festive Board"